Don Honey Leg Ham in shaved variety is a delicious ham to use on fresh ham and cheese sandwiches. There is nothing as good as a fresh ham and cheese sandwich with top quality shaved ham. This ham is a staple in our house, used for anything from sandwiches to cabonara. We love the taste, it is a little thin, but two slices can be used. 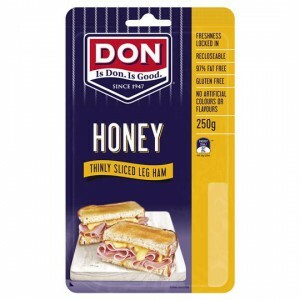 Don honey leg shaved ham is handy to have in the fridge for sandwiches for lunch,it tastes good and is a reasonable price,a good ham! How would you rate Don Ham Leg Honey Roasted Shaved?